My first day in New York City to promote the release of Way Too Big to Fail was a whirlwind, as expected. I arrived into JFK at 6:00 AM and headed into Manhattan for my first stop at the Cornell Club, which would serve the base of operations for Bill Frey and me during our day of meetings. After quickly changing out of my traveling clothes and into a suit, I ran around the corner to my first meeting – a breakfast with Daniel DeMonte, a former whole loan portfolio manager who had reinvented himself as an MBS putback transaction manager. DeMonte had already read about 60% of the book, and was generally positive about the ideas presented therein. In particular, he thought that the idea of more states passing laws to allow recourse to borrowers’ assets in the event of default on home loans would go a long way towards reducing strategic default. As we traded stories about some of the absurd mortgages we had seen when overseeing loan file reviews over the past few years, it occurred to me that even those of us who earned our livelihood by cleaning up the mess left behind by the mortgage crisis would like to see the market rebuilt and functioning again. It was a productive meeting, and I was able to get some food in my stomach, to boot. After that, I returned to the Cornell Club, where I met up with Bill for a meeting I had been anticipating for several weeks. We were meeting with Neil Barofsky, the former Assistant U.S. Attorney for the Southern District of New York and former Special Inspector General for TARP. Barofsky resigned from his post at SIGTARP earlier this year with some choice words for regulators regarding the failures of the program and the problems at our nation’s largest banks, and took a gig as a professor at NYU School of Law. The Office of Career Services at the law school had put us in touch, and Barofsky had graciously agreed to meet. The continued existence of institutions that are “too big to fail” — an undeniable byproduct of former Secretary Paulson and Secretary Geithner’s use of TARP to assure the markets that during a time of crisis that they would not let such institutions fail — is a recipe for disaster. These institutions and their leaders are incentivized to engage in precisely the sort of behavior that could trigger the next financial crisis, thus perpetuating a doomsday cycle of booms, busts, and bailouts. Since that time, Barofsky has remained outspoken about his prognosis for this country, including the famous statement he made to Dan Rather in response to the anchor’s comment upon hearing about the projected costs of the next financial crisis, “Counselor, you’re scaring me,” to which Barofsky replied, “you should be scared. I’m scared. I mean, you can’t not be scared. You can’t look at what happened in the run-up to 2008 and see how it’s not going to repeat itself, given what we’ve done.” Needless to say, I was looking forward to hearing what Barofsky had to say. When the professor arrived, we went upstairs to the Club’s library and began to talk about the book, the mortgage crisis, and the political climate in Washington. I found that Frey and Barofsky had very little disagreement about the ideas for reform that were presented in the book. However, Barofsky was skeptical about whether we would be able to build a consensus around sweeping mortgage financing reform after the passage of Dodd-Frank, as its supporters would be loath to admit that the program was a failure. Though Bill and I shared several stories about meetings with policymakers on both the left and the right who had agreed wholeheartedly with our ideas, Barofsky felt that getting these folks to agree privately was a far cry from getting them to agree publicly. Two hours flew as we spoke, and I left the meeting feeling that I had received a necessary dose of reality from someone who had been through the political meatgrinder and had seen how the sausage was made. After we parted ways, Bill and I headed back up to Greenwich to meet with a former partner in a hedge fund, who had sold his stake and was now semi-retired, but looking for opportunities. This gentleman had several contacts with the New York pension funds and felt that these investors were starved for products that would provide an investment-grade rating with a return in excess of U.S. Treasuries, but there was little out there. We agreed and suggested that some of the ideas laid out in WTBTF, pointing to the copy we had just handed him, could pave the way for the return of the MBS market. He was polite, but his sense was that housing (and employment) would not bounce back until the foreclosure process was fixed and investors had confidence that they could collect on the underlying assets if there were credit problems in the structure. Since the AG settlement over foreclosure problems seemed to be losing steam by the day, he felt that this possibility was remote. After lunch, we returned to Bill’s office to sign copies of the book and put together mailings to Washington, members of the media and other mortgage crisis thought leaders. This was the first time I had held a hardback copy of the book (of which we printed a limited run), and it was truly a glorious feeling. There’s something about the weight of a hardback, the cracking sound that it makes when you first open it, and the vibrancy of the dust jacket that instills a sense of pride and a feeling that you’ve really created something lasting see image on right). Soon, however, euphoria once again gave way to a recognition of the work that lay ahead, as we were tasked with putting together a massive number of mailings. Anyone who has ever had a wedding or a Bar Mitzvah knows that writing note cards is one of the most tedious tasks in the universe, and writing note cards for a book is no different. It took up the remainder of the day. That night, in the split second between when my head hit the pillow and when I passed out from exhaustion, the thought occurred to me that our greatest challenge in getting our ideas to take root would be pervasive pessimism. Wherever we went, people seemed to be overwhelmed by the problems facing our government and our economy, and with good reason. The gridlock in Washington, the financial fraud perpetuated by some on Wall St., and the and negligence and general sloppiness that characterized 2004-2008 mortgage lending have been the hallmark of our country over the past half decade and have caused many to despair at the possibility of ever reaching a solution. 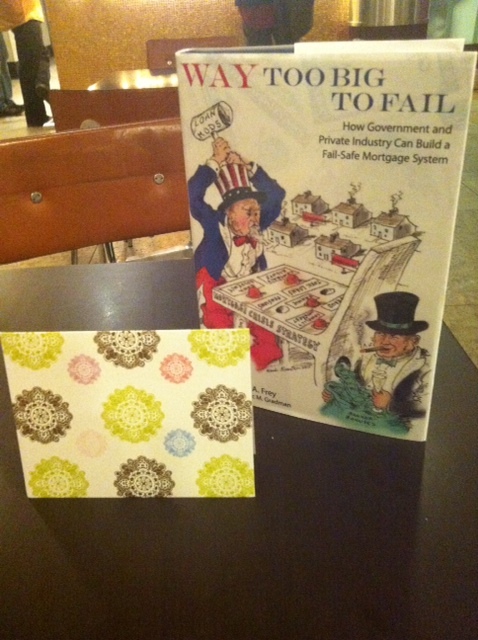 I decided that WTBTF was an important work, not only for the ideas it presented, but because it presented a message of hope and optimism – that there is a way to fix the housing market if financial leaders and regulators could simply work together to make our suggested reforms a reality. This entry was posted in Attorneys General, bailout, Dan Rather, due diligence firms, Government bailout, hedge funds, mortgage market, Neil Barofsky, putbacks, re-underwriting, Regulators, RMBS, securities, securities laws, securitization, TARP, The Subprime Shakeout, Timothy Geithner, too big to fail, Treasury, Wall St., Way Too Big to Fail, William Frey. Bookmark the permalink.